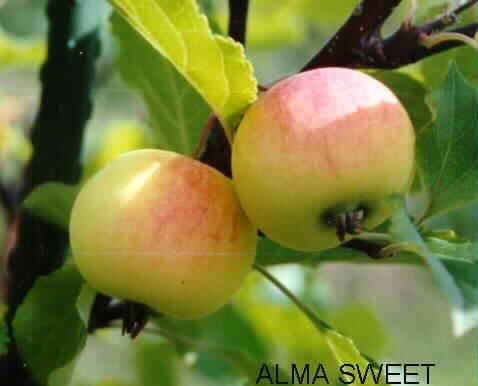 Alma Sweet is a small apple up to 2" in diameter. It gets red blush to streaks when ripe and is a short, donut-shaped apple. It is very sweet when ripe. It has varied in quality from year to year, some years being dry and kind of woody, and other years being juicier. It is always very sweet and a little bland, without the zing of the other apples that grow here, It is great for making apple sauce as it eliminates the need to add sugar and adds body to the sauce, making it creamy and sweet.